The new 445 SUV is in all respects a true embodiment of Riviera heritage. By this we mean that all the familiar - and reassuring - aspects of classic Riviera boatbuilding are there: the purposeful lines, the hefty scantlings, the solid feel in a seaway, the spatial sense, the layout, the sumptuous decor. 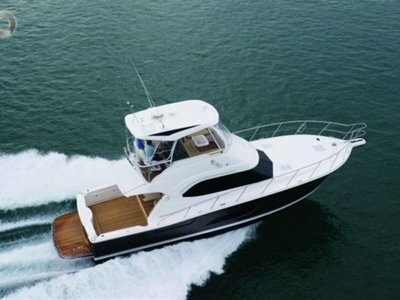 As well as a full no-nonsense Flybridge-scale cockpit. All our learning is on show here again. The SUV's confident offshore poise comes, to a large degree, from Riviera's leading-edge CAD technology and legendary build quality that combine superstrong hand layups with solid GRP bottom and structural core material on the hull flanks, main deck and hardtop, as well as precisely fitted lightweight resin transfer moldings, pre-fitted for a perfect seal when all major components are bonded together. A great deal of our acumen regarding hull shape has contributed to, for example, aft chine strakes that have a straight run, to enhance both speed and manoeuvrability, as well as a moderate Vee shape going forward, to a precise 14.5-degree deadrise at the transom to stay beautifully composed in a choppy quarter sea without diminishing top end performance. The extensive Flybridge and Sport Yacht Collections really had a big influence on the choice of IPS pod-drive propulsion as the must-have standard propulsion for the new SUV; confirmed over our now four-year experience and close collaboration with Volvo engineers on seven different Sport Yacht, Flybridge and Offshore Express models and hundreds of production craft. The system's twin engines and forward facing, counter-rotating props not only offers exhilerating performance, but precise micromanagement of handling in confined spaces. A skipper - either solo or with a novice crew - can, just using a joystick, direct the twin pod units so as to place the boat easily and exactly where it's wanted. There seem to be only upsides and upsides to the Volvo system; in efficiency, top speed, acceleration, economy, manoeuvrability and quietness. But one of the biggest advantages is that the bulk of engineering machinery can be positioned well aft, rather than amid-ships, as shaft drive engineering dictates. 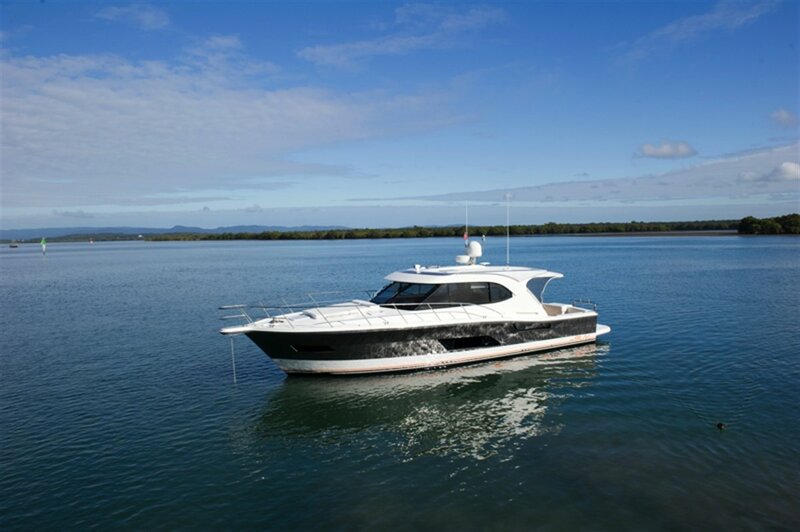 Like our Sport Yachts and the newer Flybridge models, the SUV embraces a single, much larger, flexible saloon seating design that multifunctions for dining, cocktail, coffee, reading, lounging, even extra sleeping. Up ahead of that is the protected command helm centre, comfortably sheltered within this main deckhouse saloon. 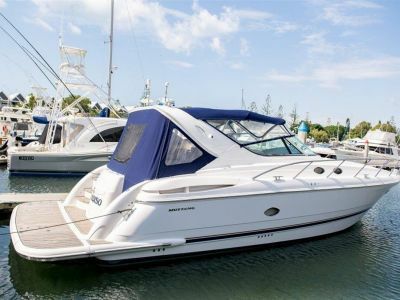 It's like having a very spacious Enclosed Flybridge on the main deck level. And back aft, a new galley design sits centre-stage between the saloon and cockpit, in quiet conversational proximity to the aft-facing mezzanine lounge, just outside. But that's really, like any traditional Flybridge, the only fixed amenities (apart from copious side lockers and sink/fridge), in the entire large cockpit area. Stowable tables and chairs can be brought out when needed. More room and more styleSuper-efficient use of space is fully capitalised upon below decks, indebted to CAD and the IPS propulsion configuration. This opens the way for guest accommodations to dominate amidships and extend beam-to-beam, offering up to three additional berths. Yet leaving plenty of spare volume for large, concealed cupboard space. The opulent Master Stateroom forward allows for a queen size island bed of a full two metres in length. The bed is also a useful storage facility itself with large drawers under and flanked by full-length wardrobe hanging space. In between both these large staterooms there is plenty of room for two generous and beautifully appointed bathrooms: a guest/day head aft to starboard and an ensuite for the master forward to port. It's down in this area that you'll probably notice, even more, another advancement that the 445 SUV ushers in:International yacht interior designer Georgia Dirudi has created an entirely fresh design scheme for internal spaces. It introduces a whole new-look palette of calming but warm colours: champagne, crème, straw, manila with a fresh touch of colour; in surfaces of laminate, leather, suede, mirror, American oak, plush sisal carpet and subtle waffle fabric textures.